On beaches and at pools around the world, children and adults of all ages wear simple shoes that consist of a thin rubber sole with a y-shaped strap that goes across the top of the foot and between the first (“big”) and second toes. Yes, we’re talking about flip-flops! All you need to do to figure out why we call them “flip-flops” is to walk around in a pair of them for just a little while. Because of how they’re made, the rubber soles slap against the bottom of your feet as you walk, making a flip-flop, flip-flop sound. The name “flip-flop” is thus an example of onomatopoeia. People believe flip-flops first appeared in America after World War II, when returning soldiers brought zori back from Japan as souvenirs. Flip-flops then became even more popular after soldiers returned from the Korean War in the 1950s. 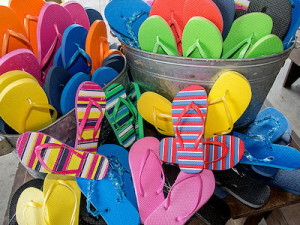 Although the name “flip-flops” originated in America in the 1950s, flip-flops go way, way back in time. Experts believe flip-flops have been around for at least 6,000 years. Ancient Egyptian murals on tombs and temples show flip-flops were worn around 4,000 B.C. Not everyone around the world calls them “flip-flops,” though. Even some areas of the United States have special names for them. This entry was posted in Fun Fact Friday!. Bookmark the permalink.